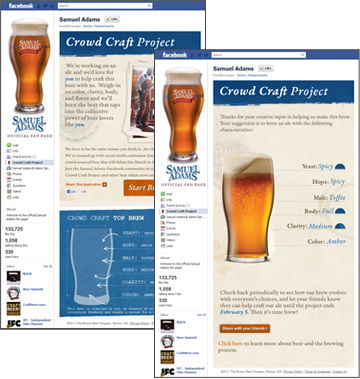 Samuel Adams fans can have their say on the creation of a new beer by using the ‘Crowd Craft Project’ app hosted on the Samuel Adams Facebook page. Fans can use the app to select the color, clarity, body, malt, hops and yeast for the crowd sourced brew, as well as learn more about the brewing process. The folks at Samuel Adams will begin the brewing process once the voting ends on February . 5th. The beer will make it’s debut at Guy Kawaski’s Girl + Guy party on march 10 at the SXSW Interactive Festival, as well as select bars in Austin and Boston.